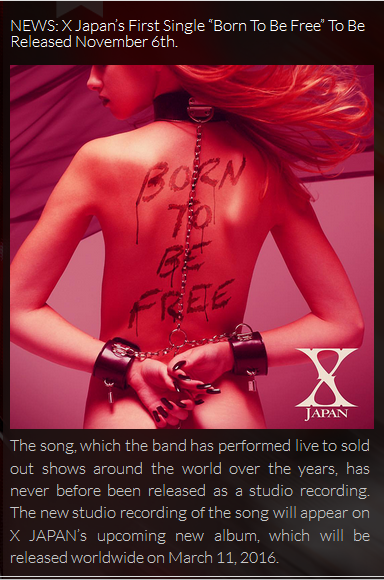 Yoshiki dropped the bomb on us on Monday 12th October, 2015 with the announcement of a new single, Born To Be Free, on the 6th of November. Yoshiki, muy como es él, soltó ayer 12 de octubre la bomba: nuevo single de X Japan, Born To Be Free, a la venta el 6 de noviembre. A few minutes later, we could read Sugizo’s facebook post, with an extra bomb: Streaming, starting October 13th at 10 am UK time. A los pocos minutos, Sugizo nos dejaba otra bomba. No sólo podíamos fiarnos del anuncio del single, sino que estaría disponible en streaming el 13 de octubre a las 10 de la mañana hora británica. You can access the streaming at MetalHammer for 24 hours. Not available any more. Reportedly, the fans crashed the site five times accessing the stream .El streaming estará en MetalHammer durante 24 horas. El streaming ya no está disponible. Fuentes dicen que el servidor se colapsó cinco veces. At the moment we have no further information related the format or pricing. Chances seem to be that it is a digital single as what we see is not a CD cover, but we’ll have to wait for more news. Tokyohive confirms that it is a digital single. We’ll add information as it becomes available (we’re rooting for some info in the Yoshikimono press conference). November 6th: The single is out on itunes, it has the one song, 5:32 minutes (£0.99, US$1.29) Esto es todo lo que sabemos de momento – no hay información sobre formatos, disponibildad o precios. Probablemente, basándonos en que no tenemos foto de ‘portada de CD’, sino sólo la imagen, sea un single digital. Tokyohive (en inglés) confirma que es un single digital. This entry was posted in Castellano, English, Showbiz-Entretenimiento and tagged album/single, announcement, anuncio, música, music. Bookmark the permalink.